Geograph Images is a browser script that adds nearby Geograph images to geocaching.com cache pages. It works with Firefox, Google Chrome and Opera. Geograph is a project that aims to collect geographically representative photographs and information for every square kilometre of the country. There are currently three Geograph websites covering Britain and Ireland, the Channel Islands and Germany. 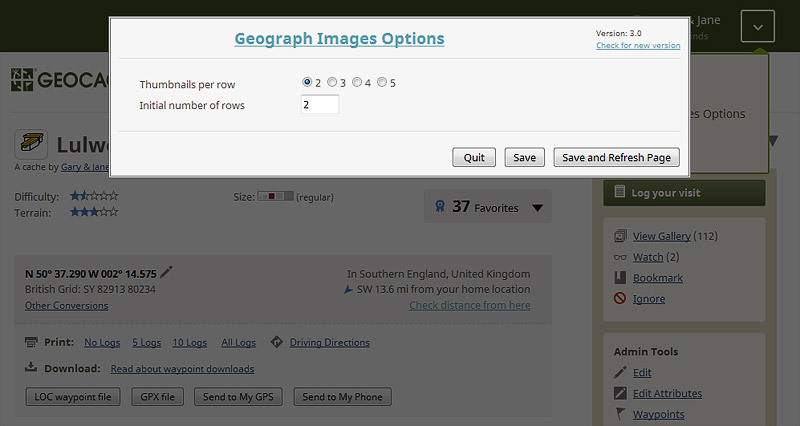 If nearby Geograph images are available a new Geograph Images section is added to the cache page. By default a single row of the nearest two images is shown. More images can be shown by clicking on the (more) link. Each click will add another row until all the available images are shown or a maximum of 30 is reached. Clicking an image will pop-up the full size image in the existing 'lightbox' feature. Clicking the sides of this full size image will allow you to move between all the Geograph images currently shown. Additionally if you also have the Geothumbs script installed you will be able to seamlessly move between all the Geograph images, cache owner images and log images on the cache page. Clicking the text description next to the image thumbnail will bypass the 'lightbox' and open the Geograph page for this image. 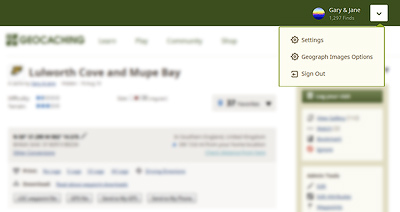 The Geograph website home page can be accessed by either clicking the Geograph Images header or the graphical icon at the top right of the image table. Geograph Images can be configured to your preferred operation by selecting 'Geograph Images Options' in the drop-down menu box shown to the right of your user name at the top of each cache page. You will be automatically notified whenever an update to the script becomes available. Many thanks to Barry Hunter at Geograph Britain and Ireland for his help and permission to access the Geograph data. To install click on the icon above and select the "Install" button. Please ensure that you've installed the Firefox Greasemonkey add-on before attempting to install this script. To install click on the icon above and select the "Install", "Reinstall" or "Update" button. Please ensure that you've installed the Chrome Tampermonkey add-on before attempting to install this script. To install click on the icon above and select the "Install", "Reinstall" or "Update" button. Please ensure that you've installed the Opera Tampermonkey add-on before attempting to install this script. Updated to work with Geocaching.com site changes made in March 2015. Fix problem where Geographimages is non operational after reinstallation under Greasemonkey versions 2.0 onwards. Added work around for bug in Google Chrome. Google Chrome now supported again! Google Chrome not supported due to bug in Chrome 28.0 and 29.0.